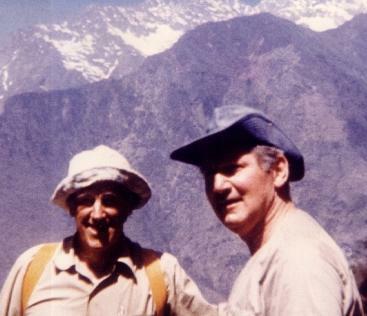 Zeke O’Connor (right) and Sir Edmund Hillary in Nepal. But not all Western action around Everest is so easily condemnable, and, as proof, we bring you the story of Zeke O’Connor. CFL fans know O’Connor as the tight end who caught the winning touchdown in the 1952 Grey Cup, the last time the Toronto Argonauts won the championship. But thousands of miles across the world, generations of Sherpas and high altitude mountaineers know O’Connor as a close friend of Sir Edmund Hillary and the founder of the Sir Edmund Hillary Foundation of Canada. O’Connor fell in love with the area during his first visit to Everest Base Camp in 1973 and left wondering what he could do give back to his hosts in Solukhumbu region. It was out of this desire to “help the Sherpas help themselves” that the Sir Edmund Hillary Foundation of Canada was born and, since receiving its charter on Oct. 1, 1976, the foundation has been integral in funding and operating the Kunde Hospital and major reforestation programs in the Khumbu Region. And even though O’Connor passed most of the administrative duties over to his daughter, Karen, in 2008, the 88-year-old shows no signs of slowing down. He published his memoir, Journey with the Sherpas, in 2012 and still regularly makes the trip over to Nepal to check up on the foundation’s projects. We caught up with Zeke to talk about the foundation, the April avalanche and his favorite moments from the last 40 years. 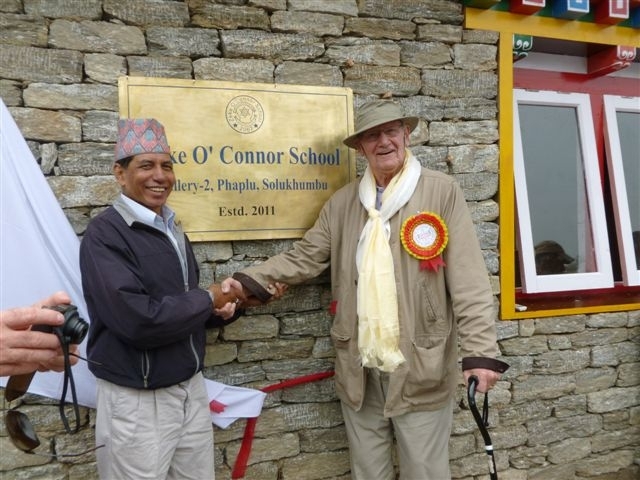 Zeke O’Connor in front of the Zeke O’Connor High School in Phaplu. Mountain Life: I’ll jump right in: What’s happened with the foundation’s projects since the book was published? Zeke O’Connor: With the reforestation project, we were supposed to close it out after we paid off the people that were working a pension a few years ago. We turned it over to a buffer committee but they were having some trouble with the government, with money and so on, so we’ve stayed attached with it to ensure that work we started and finished didn’t deteriorate. So far we’re pleased with the way it’s being handled in this transition period. In the hospital, we are expanding a bit and plan to do a lot more pre- and postnatal care. Dr. Kami [Sherpa], who’s the head of the hospital, is working on that, and we’ve had a couple of people interested in helping us. Those are in the Khumbu and, down in the Solukhumbu, we’re in the process of putting sciences into grades 11 and 12 for the first time. So those are the things we’re really working on right now. I’m actually just back from there. I was over there in April. The Kunde Hospital, which has been funded by the Sir Edmund Hillary Foundation for over 34 years. ML: So you were over there during the avalanche? ZO: Yes, but I was in a different part of Nepal than where the avalanche took place. But I did get to meet a lot of the people, including some who were on the mountain during the avalanche… It was quite upsetting to the Sherpa community. In most cases, it reached either a family member or a close friend’s family. The Sherpas are very used to death on the mountain. This was a big one, but there are so many deaths on the mountain every year, both from avalanches and pulmonary and cerebral edema, and things like that. And, with the Buddhists, they believe in reincarnation, so death isn’t quite the same as it is for us in North America, but they certainly miss their families. We at the foundation have been working for more than 10 years now with the widows of Sherpas who have been killed on the mountain and have set up a fund for the families of those involved in the avalanche. ML: Do you feel like something needs to change? And who is responsible for leading it? ZO: I think it’s a little bit of everyone, including the trekking companies and the climbing community itself, to establish some better basic principals, particularly for the people who have to go on the mountain to make a living and the ones who are left behind and need some kind of insurance… But I think that the whole situation, including government’s responsibility and their licensing, has to be looked at. Too many times, even when there isn’t death, there is awful confusion on the mountain in a dangerous place where there shouldn’t be confusion. That’s my opinion, but I’m not a climber. ML: Part of the problem is that more people are on the mountain. As the area becomes more popular, are the goals of the foundation changing? ZO: Our mandate is geared strictly to the environment, education and medical care of the Sherpa people. We do take care of the climbers and trekkers that need to use the hospital but the hospital and the theory of Hillary was to help the Sherpas help themselves. So my hope is that we can continue to work in those areas to make life a little better for the Sherpas. We really aren’t up there for anything else. 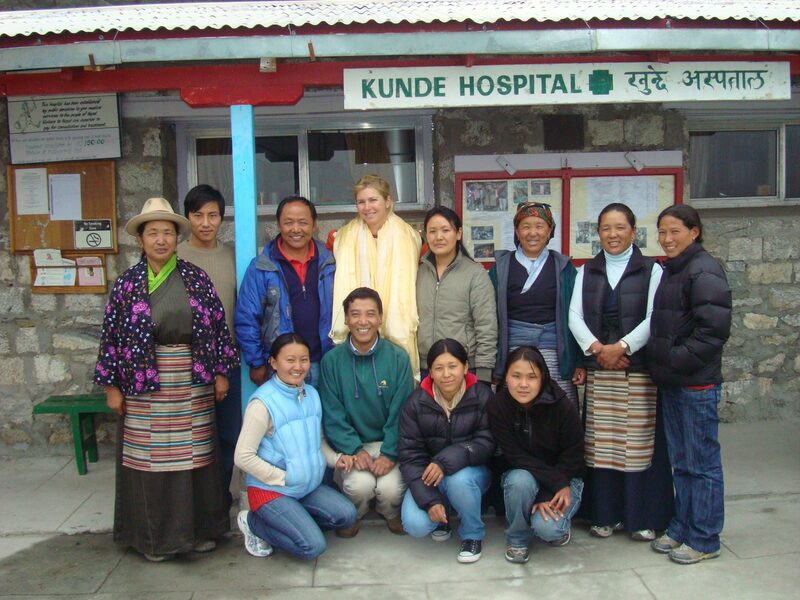 Karen O’Connor with the staff of the Kunde Hospital, including Dr. Kami Temba Sherpa. ML: That’s kind of the philosophy behind the foundation, right? ZO: We don’t tell them what to do, they tell us. And we react to that with funding or more people. The hospital is now completely run by local people that we have helped educate. We’ve had six graduated doctors that are practicing. They’ve first helped us in Khude and then moved on to their own practices. And we have four in school now. ML: Do you have a favorite moment from your time with the foundation? ZO: In 1986, I founded Special Olympics in Nepal with two local people so that they could come to [my alma mater] Notre Dame for the world games. And at the same time I was working with the Special Olympics here in Canada, and they asked me to the honorary head coach. And I was able to lead that [Canadian] team into the stadium at Notre Dame. That’s one of the highlights of my career. Then just last year, I was introduced to the queen of England in London at an official event for the 60th anniversary of the climb of Everest. I was also invited by the Canadian government to represent Canada at [Sir Edmund] Hillary’s funeral and it was the first time anyone outside of government ever represented Canada at a state funeral. So I’ve had so many wonderful moments and it’s so hard to pick just one but I supposed…. Hmm… I don’t know… I guess maybe celebrating my 88th birthday this year. I never thought I would make it this far. 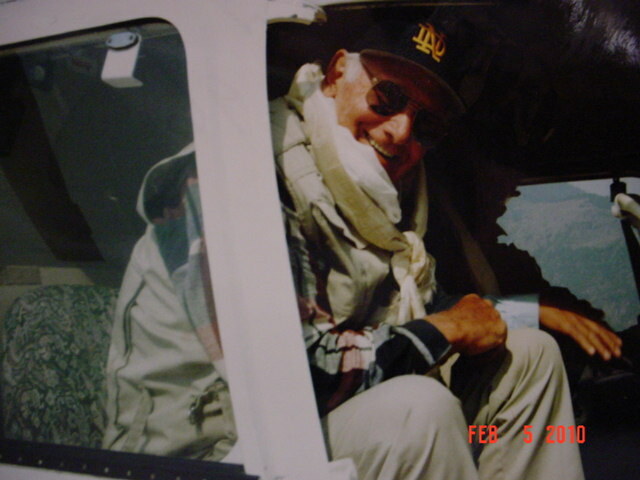 Zeke O’Connor flying into Nepal. ML: Last question: what’s the best way to get involved with the foundation? ZO: The website is the best way, but the book [Journey with the Sherpas] is still on sale and you can buy those on Amazon or through the website. 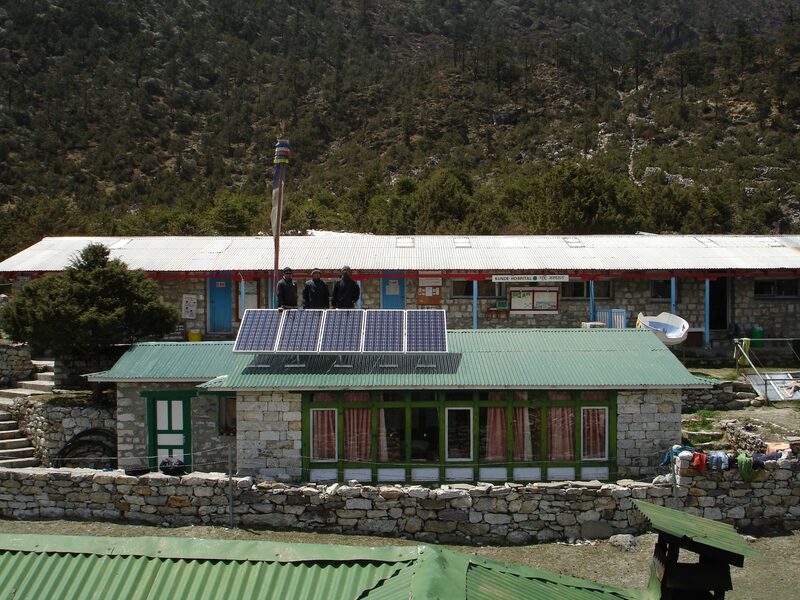 As far as donations, we certainly could use help at the school at Phaplu with bringing in the sciences. The cost of bringing science teachers up the mountain for one or two years is expensive. But, more generally, we are just asking for people to help the Sherpas in any way they can and making donations through the foundation allows us to put the money where they really need it.